The stark contrast between my life and its petty troubles and the situation in Haiti currently is something my brain cannot wrap itself around terribly well. Until I saw the photos, I had no idea what the devastation was like… the NPR stories conveyed blood running down the streets into drains and pancaked buildings, but until I saw some actual images,I had no idea of the scope of this tragedy. I’ve sent in my meager $15, and I would encourage all of you to send along some amount you can afford, as well. Haiti’s infrastructure is gone… they’re having a terrible time getting aid for immediate relief, and the long-term recovery is going to be brutal. There are some fairly graphic photos here – nothing gruesome for gore’s sake, but there are dead bodies shown. People are sleeping in the streets without adequate food or water. There aren’t enough trucks or fuel to move supplies. Officials are asking residents to leave their dead by the curbside for pickup by trucks. Rescue workers still dig through rubble night and day, although at this point, it is more of a recovery operation than a rescue endeavor. I am beginning to hear people saying they are tired of hearing about Haiti, and others are tired of everyone “jumping on the Haiti bandwagon.” What makes this disaster different from so many others occurring every day? My impressions are these: Partially, it is because Haiti is an island – there is no area of their country which can come to their aid. Partially, it is because Haiti is one of the poorest nations in the world, with meager resources to begin with, and with nothing left now. This is not to downplay the horrific conditions which people worldwide must endure on a daily basis, but the starvation problems in various areas of Africa and the disease epidemics in Asia require different solutions and must be addressed in a different manner. The situation is no less acute for the people suffering through it, but the urgency the rest of the world feels is, perhaps sadly, farther removed. Which brings up the topic, once the initial shock and subsequent international support wears off, how many will stay behind to help Haiti rebuild? We went and saw Avatar last night. At the risk of sounding like everyone else, I found the movie so deeply moving; it touched upon some of my most profound wishes and yearnings, gouged at sensitive spots, soothed them back again. It brought to mind several times the crisis in Haiti. When the Navi were all gathered around a special tree after a tragedy beyond their reckoning, they sing spiritual songs, not knowing what else to do. People in the streets of Port au Prince have been singing a psalm, “beni soit le nom de Seigneur,” having nothing else to turn to. Additionally, the Navi seem largely modeled upon Black and Native American peoples. While I did not find any of the characterizations to be offensive, being a completely White person myself, I may not be sensitized to some aspect of cultural references that may have been objectionable. Too, I aspire to a Navi-like life; it is my ultimate fantasty world, and this may render me completely naive to certain realities here. 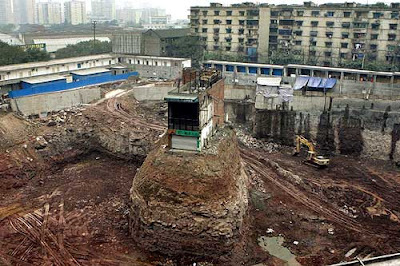 Phawk pointed out the impact the film is having on the Chinese government’s hostile razing of homes to the ground. From what I’ve read, the Chinese people feel the plotline could have been taken directly from their plight. If we can get the Chinese government of all things moving down the right path, perhaps miracles can indeed happen. Avatar gives me such hope for the world… so many people have been profoundly touched by it on deep, personal levels. James Cameron has give us all quite a gift with this film. It makes me hopeful that some, certainly not all, people will perhaps begin to think of the consequences of their actions, perhaps extend more compassion not only to other people, but to our world itself. Avatar plainly and unblinkingly displays the atrocities of which we humans are capable, but ultimately, the message is one of redemption, strength and hope. If enough people are inspired by Avatar to try to make a difference in life, that cumulative effect can have tremendous weight. My friend Dennis is getting a new project off the ground: Small Change. It’s not much yet beyond a Twitter presence, but the idea has great potential. His plan is to connect benefactors with projects or volunteers, as well as to promote weekly small changes we can all easily make that will have a cumulatively large effect. I vacillate wildly between “people are inherently awful” and “people are inherently wonderful,” depending upon the news of the day, and naturally, the truth lies somewhere in between. Truth be told, I don’t think we are inherently anything, really… but in groups, we can rationalize nearly any bad behavior. Conversely, in groups, nothing can stop us from effecting great change for good. If Avatar can somehow begin motivating people to do the right thing, whatever thing that might be in the contexts of their individual lives, I, for one, will gladly suffer being cast among the increasingly large group of “simple-minded” people who have been enthralled by it. Was it a perfect movie? No. But it was a beautiful, poignant, exhilarating, skilled and powerful one. Was it predictable? Yes. Did that really matter? No – Cameron’s story-telling was brilliant, even though most of us probably knew where everything was going very soon after the movie started. There were very few dry eyes at the end. If I can yank you out of Pandora for a moment and back into our world, President Obama has received scathing criticism from the right for showing respect for other cultures, for bowing to a foreign leader, for not being the typical, heavy-handed American leader that has been that office’s shameful legacy for decades. I’d like to think billions of small changes paved his way into the White House, and that he will engender several billion more with his approach to world diplomacy. Maybe there is hope to be had, not just on a small scale, but on a global one. Perhaps Haiti can be a stepping stone to better international cooperation, and something constructive can come of this overwhelming tragedy. The images I have been seeing on TV are breaking my heart. I feel so grateful that I am an American, safe for the most part but at the same time I am frustrated with our greed as a whole. We could do so much more…so much more than War. I am honored that we can help as much as we are.